That is all for today's live page with Charles Leclerc showing his class to lead the way. Stay across the BBC Sport website for a full report later on. Thank you all for your excellent comments on the best and worst-looking cars of all time. You've been brilliant and sorry we couldn't get through them all, there were hundreds! Niamh Lewis is in the chair tomorrow for the final day of testing so join her from 08:00. It's been a lot of fun and hopefully speak to you all soon. Thanks and until next time, bye for now. A good sprint at the end from Romain Grosjean after a frustrating start to the afternoon. These are the final totals for today. The top eight were all on the softest tyres the C5s, as was Russell. Hamilton was on the second hardest C2s, with Magnussen and Bottas on the C3 mediums and Grosjean on the C4s (second softest). Ferrari bounce back in style from practically no running yesterday afternoon to being fastest on Thursday. Ricciardo, Bottas and Albon get out there for a couple of late laps. Actually, that may well be it. Bottas is waiting in the pitlane to go back out, but we're still under the red flag so time may well beat him. We have a 10-minute blast left for anyone who fancies some flying laps. Leclerc, fastest today, stops on track between Turns 7 and 8. With so many laps turned during testing and a lack of live television coverage for every car on every lap, plenty of mistakes go unseen. Romain Grosjean took over from Kevin Magnussen at Haas for the afternoon but was hampered by the red flag caused by Lance Stroll and only got to start his running in this final hour. And two corners after this photo was taken, the Frenchman went off at Turn 12, scrabbling around the outside of the gravel and rejoining. No damage caused, and with no time to waste he started weaving to clean up the tyres and carried on with his running. Williams chief technical officer Paddy Lowe has been talking about the team's pre-season, and their late start which caused them to miss the first two and a half days of testing. He says as things have worked out, they have not missed out too much. “If we stay on this plan, we will have done the same mileage and consumed all the sets of tyres available as if we had done the full eight days," Lowe said. "A lot of the limitation in testing is the number of sets of tyres. So in terms of mileage and number of experiments we will have achieved the same as we originally intended. Game over for today for Pierre Gasly. That was a big hit up at Turn 9 - the car swapping ends early in the high-speed corner - and going rear first into the barrier. 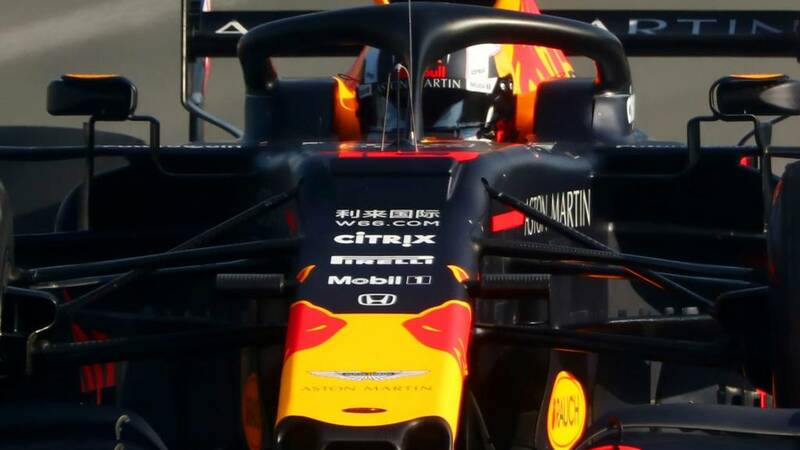 Honda had to change the power unit in the Red Bull after Gasly’s crash last week and it looks like the same will be needed now, which makes any further running highly unlikely today. Gasly himself is already changed and has just walked out of the paddock alongside some senior Red Bull staff, but was polite enough to still stop for a photo with a Mercedes fan as he went. Grin and bear it. Williams took advantage of that red flag delay for some pitstop practice. Which are the best and worst-looking F1 cars of all time? Been far too long since we had some of the best-looking cars ever, so time to correct that. We are go again for one more hour. Pierre Gasly went into the barrier at Turn 9, but it is not as serious for Lance Stroll as he has parked on the straight between Turns 9 and 10. Lance Stroll in a bit of bother. We had seven drivers do more than 100 laps yesterday and we've already had two on Thursday with both Charles Leclerc and George Russell well over 100.